Are you getting married? Do you want to arrive at your wedding ceremony and reception in style? Then you should hire Jaguar wedding cars. While there are a lot of stylish cars out there that can meet your wedding transport needs, nothing beats Jaguar wedding cars—they’re classy, comfortable and safe—but what are the benefits of hiring them for weddings? 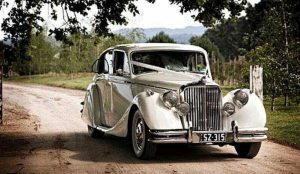 Most Jaguar wedding cars on the market come with stylish vintage and modern features. The plush leather seats and intricate wood panels/woodwork add a touch of vintage glamour while air conditioning, mini bars, DVD players and stereos complement the vintage glamour by fulfilling modern needs. The photogenic exterior features of Jaguar wedding cars perfectly complement their stylish interior features. With the option of two-tone colours (ivory/black), as well as elegant curves, and chrome striping, Jaguars provide the perfect backdrop for spectacular wedding photos. Another benefit of Jaguars for wedding cars is that the different models complement each other effortlessly. Jaguar Sedans and Convertibles are known to complement each other well and are constantly recommended for weddings, as they are both useful for wedding transport and are a unique background feature for photographs. Whether you have a small or large bridal party, as Jaguars generally seat 3 to 4 passengers, if you have a small bridal party, one Jaguar will easily accommodate to this. However if you decide to hire two Jaguars for a unique backdrop to your wedding photos, they can also provide the benefit of transporting a medium to large bridal party. Some styles of vehicle are recommended more than others to transport bridal parties, for example Jaguars are often the choice for lead bridal cars due to their striking looks. As well as all of the aesthetic and practical benefits, one obvious benefit that may be overlooked when hiring Jaguar wedding cars is the fact that sitting and being driven around in one could be a dream come true for a car fanatic—no matter whom the car fanatic may be in the happy couple. Now you know of five benefits of hiring Jaguar wedding cars. All you have to do is pick which one suits you best or you can contact us directly here with any questions you may have.